Success of the social media profiles depends on the how you create and modified it for giving precious look and related to your niche and this post will guide you about Twitter background image size and ideal twitter header image size with cover photo also to make it perfect in the look and for grabbing attention of the users of this top micro blogging site. This is our second very useful post on Twitter after the first on how to get free followers easily in very less time and you need to understand clearly that complete profile with eye catching photos also play an important role in getting more output from your profile, increasing performance like more tweets, re-tweets and mentions also. 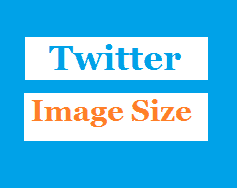 As we have been found on Twitter Support Articles, The recommended dimensions of header photo are 1500×500 pixels and profile photo are 400×400 pixels which sounds good and you can also try the same size of image for making the look ideal and for maximum visibility in front of readers also. You must remember that it does not support animated GIFs image for header or profile. As per our experience of using this platform and according to my personal observation 1820 x 1080 pixels is the decent dimensions for the background photo and this can be perfect for running on any device platform and will grab attention of the visitors and will helpful for you in showing the all important data about your blog or business website including the other details in background which you want to show to in from of other peoples. Hey my friends creating profiles only and adding information about you is not enough and you have to work more on images also because we all know that any visual pic is ten times effective that words and complete profile with eye catching visualization is better and more effective than empty profiles also. You can find best stock photos sites for free pics for your social profile Whatsapp Dp Images also.